This recipe involves two things that are fairly new to my life. 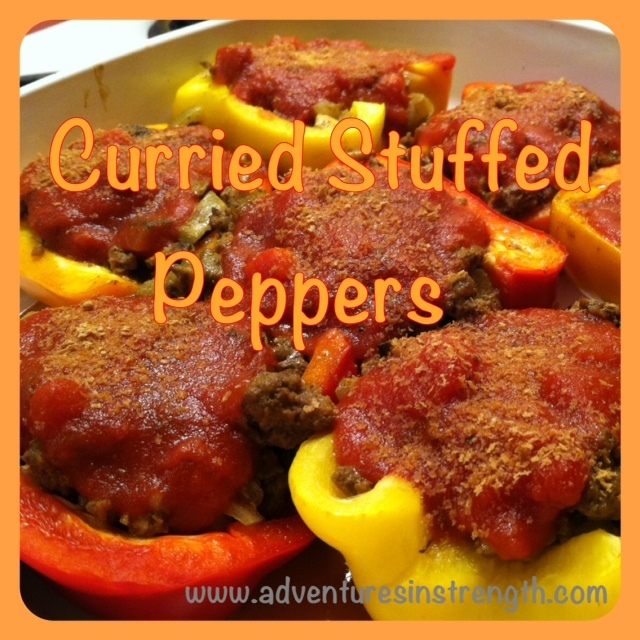 The whole concept of stuffed peppers. Yup, never had them until I started making them last summer! And curry. I know. I have seriously been missing out. 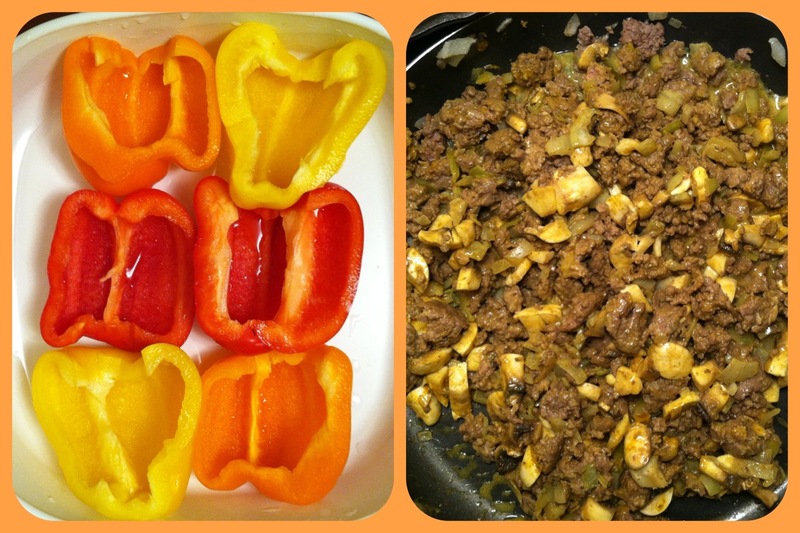 After combining these two ingredients, I am pretty sure that I will never make stuffed peppers any other way! And, can I just say how nice it was to be eating a vegetable other than spinach? Winter means crazy expensive vegetables that have very little taste, so I usually avoid buying anything other than spinach and mushrooms. However, sweet peppers were on sale! Preheat your oven to 325°F. Place your halved peppers in a casserole dish and bake for 20 minutes or until slightly softened. In a pan, cook the ground beef and onions. Drain the meat if necessary once it is cooked through. Add the mushrooms, coconut milk, and spices. Simmer for about 10 minutes. Sprinkle with Brewer’s Yeast before serving if you’d like. Not only are these amazing right after they are made, but they are also great as leftovers! They will surely inspire some lunch room jealousy! P.S. This recipe is dedicated to my Mama because she came up with the ingenious idea to add the curry! I just expanded the recipe with coconut milk! 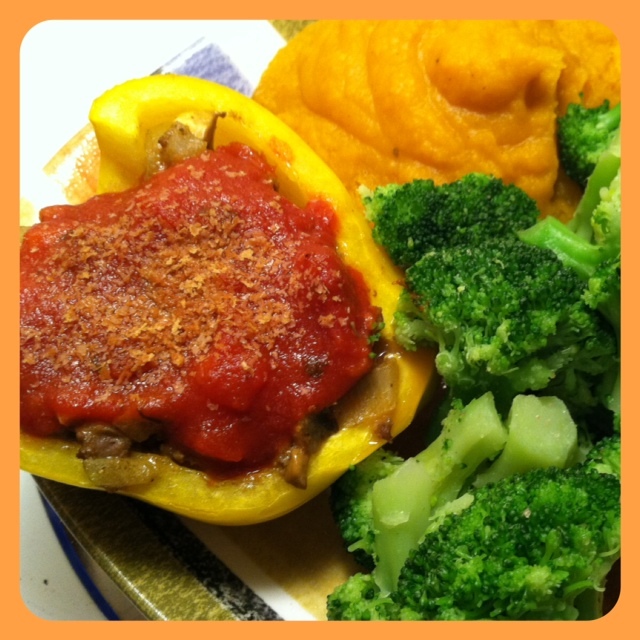 What is your favorite stuffed pepper recipe? I have to admit that I kind of love Valentine’s Day. All of the red and pink, cute heart decorations, chocolate… But then again, I pretty much love every holiday and any excuse to buy special holiday food, decorations, etc… Anyways, remember those dates (haha) I bought? Well I put them to good use in a easy energy bite recipe. Similar to larabars, but lots cheaper! In a food processor blend the dates. 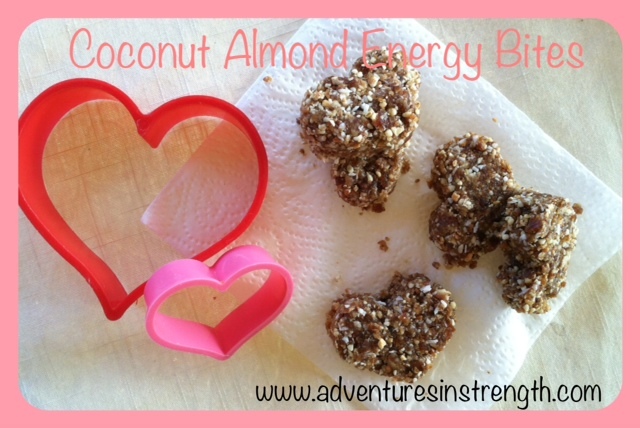 Add the almonds and blend. Add the coconut last and blend until the ingredients are evenly mixed. Note: Add chocolate chips for a little extra Valentine’s Day love! Even though Spring is supposed to come early according to the groundhog, it still seems very far away. Which means I have a few more months of wearing layers and preparing warm comfort food! 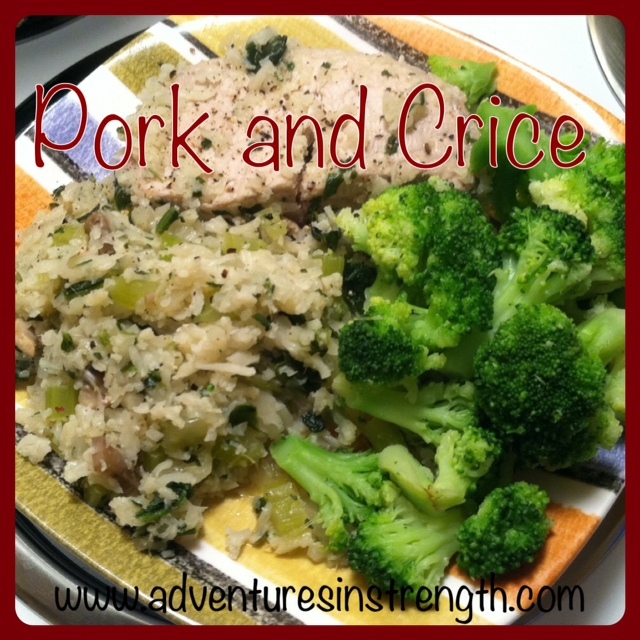 Pork and rice is used to be one of my favorite meals. My Mom would use her gigantic cast iron pan sear the pork chops before simmering them in a collection of rice and vegetables. Not only was dinner fabulous, but the leftovers were even better! Comfort food at it’s best! I am not sure why I haven’t thought to recreate this meal with Crice before now. Crice, or cauliflower rice, is one of my favorite meal ‘bases.’ The cauliflower can be seasoned with anything and works with tacos, stir fry, as a base for pizza, stuffed peppers, and even breakfast! Can you tell I’m a little in love? 1. If using frozen cauliflower, defrost it in the microwave. Then use a food processor to shred. 2. Heat your oil in pan. Dice your onion, garlic, and celery. Add these to the pan and let cook until softened. 4. 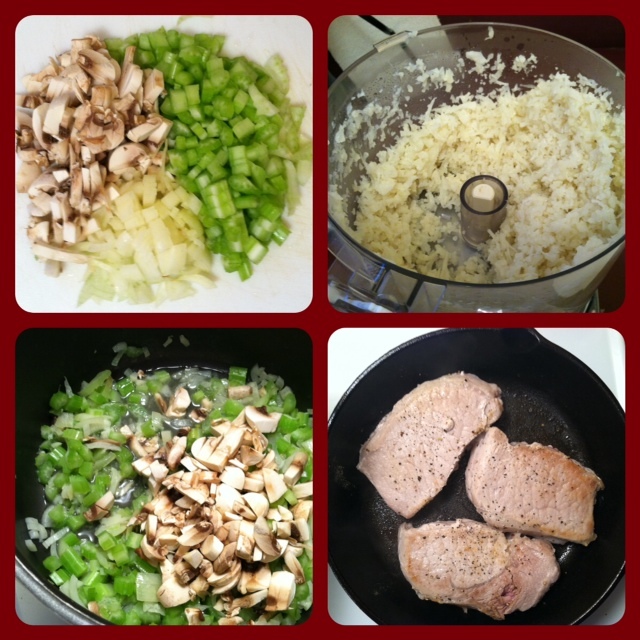 Add your mushrooms, spinach, crice, and broth to the onion and celery mixture. Add your garlic and onion powder. Once your pork chops are seared, place them in the crice. Cover and let simmer for 20 minutes or until the pork is cooked through. Enjoy! What is your favorite comfort food to make?